Creolizing Europe critically interrogates creolization as the decolonial, rhizomatic thinking necessary for understanding the cultural and social transformations set in motion through trans/national dislocations. Exploring the usefulness, transferability, and limitations of creolization for thinking post/coloniality, raciality and othering not only as historical legacies but as immanent to and constitutive of European societies, this volume develops an interdisciplinary dialogue between the social sciences and the humanities. It juxtaposes US-UK debates on ‘hybridity’, ‘mixed-race’ and the ‘Black Atlantic’ with Caribbean and Latin American theorizations of cultural mixing in order to engage with Europe as a permanent scene of Édouard Glissant’s creolization. Further, through a comparative methodological angle, the focus on Europe is broadened in order to understand the role of Europe’s colonial past in the shaping of its post/migrant and diasporic present. ‘Europe’ thus becomes an expanded and contested term, unthinkable without reference to its historical legacies and possible futures. While not all the contributions in this volume explicitly address Edouard Glissant’s approach to creolization, they all engage with aspects of his thinking. 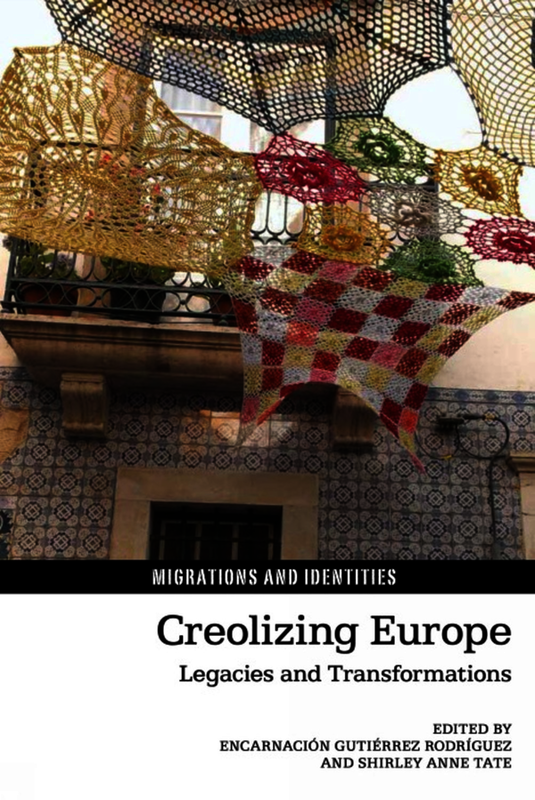 All of the chapters explore the usefulness, transferability, and limitations of creolization to the European context. As such, this edited collection offers a significant contribution and intervention in the fields of European Studies, Postcolonial Studies, and Cultural Studies on two levels. First, by emphasizing that race and “cultural mixing” are central to any thinking about and theorization on/of Europe, and second, by applying Glissant’s perspective to a variety of empirical work on diasporic spaces, conviviality, citizenship, aesthetics, race, racism, sexuality, gender, cultural representation and memory. An Open Access edition of this work is available on the OAPEN Library. Contributors David Corkill is Visiting Lecturer at the University of Chester having previously worked at MMU, Portsmouth and Leeds universities. He has written extensively on the economies and societies of Spain and Portugal. Umut Erel is Lecturer in Sociology and a member of the Centre for Citizenship, Identities and Governance at the Open University, UK. Umut’s research interests are in migration, ethnicity, gender, class and citizenship. Recent publications include, Migrant Women Transforming Citizenship. Aldershot: Ashgate (2009), ‘Kurdish Migrant mothers enacting citizenship’, Citizenship Studies, Nov. 2013. Encarnación Gutiérrez Rodríguez is Chair in Sociology at the Justus-Liebig University Giessen, Germany. Previous to her appointment in Giessen she was a Senior Lecturer in Transcultural Studies at the University of Manchester, UK. She is the author of Intellektuelle Migrantinnen (1999) and Migration, Domestic Work and Affect (2010), and the co-editor of Spricht die Subalterne Deutsch? Migration und Postkoloniale Kritik (2003), Gouvernementalität (2003) and Decolonizing European Sociology (2010). Stuart Hall, influential cultural theorist, campaigner and founding editor of the New Left Review, was Emeritus Professor at the Open University, UK. In 2005 he was made a fellow of the British Academy. His published work includes the collaborative volumes Resistance Through Rituals (1975); Culture, Media, Language (1980); Politics and Ideology (1986); The Hard Road to Renewal (1988); New Times (1989); Critical Dialogues in Cultural Studies (1996); and Different: A Historical Context: Contemporary Photographers and Black Identity (2001). In 2013 he published with Doreen Massey and Michael Rustin After Neoliberalism? The Kilburn Manifesto, a statement being made in twelve monthly instalments, critically examining the nature of neoliberalism locally, in the United Kingdom, and globally. Christian Klesse is Senior Lecturer in Cultural Studies in the Department of Sociology at Manchester Metropolitan University, UK. His research interests include sexual politics, sexual cultures and questions of embodiment. He is currently engaged in collaborative research on transnational LGBTQ politics (with a focus on Poland) and Queer Film Festivals in Europe. His most recent publications include a co-edited special issue on Gender, Sexuality and Political Economy in the International Journal of Politics, Culture and Society (27(2), June, 2014. Mónica G. Moreno Figueroa is a Lecturer in Sociology at the University of Cambridge, previously she was a Senior Lecturer at the University of Newcastle. Her research and publications have focused on the lived experience of ‘race’ and racism in Mexico; beauty, emotions and feminist theory; and visual methodologies and applied research collaborations. She is currently completing a book on the everyday life of racism in Mexico and has published in a variety of journals and edited collections. H. Adlai Murdoch is Professor of Romance Languages and Director of Africana Studies at Tufts University. He is the author of Creole Identity in the French Caribbean Novel (2001), and of Creolizing the Metropole: Migratory Metropolitan Caribbean Identities in Literature and Film (2012), and the co-editor of the essay collections Postcolonial Theory and Francophone Literary Studies (2005), Francophone Cultures and Geographies of Identity (2013), and Metropolitan Mosaics and Melting-Pots-Paris and Montreal in Francophone Literatures (2013). Alpesh Kantilal Patel is an Assistant Professor in Contemporary Art and Theory at Florida International University in Miami. He is also Director of the Master of Fine Arts programme in Visual Arts and an affiliate faculty both of the African & African Diaspora programme and the Women's and Gender Studies Centre. His book project provisionally titled “Productive Failure: Writing Queer Transnational South Asian Art Histories” is under contract with Manchester University Press. José Carlos Pina Almeida, Ph.D. in Sociology by the University of Bristol in 2001. Lecturer in the Instituto Piaget University, Portugal until 2006 and since then he has been a research fellow at the Migration Research Unit of the University College London and at the Manchester European Research Institute, Manchester Metropolitan University. His research was funded by the Fundação para a Ciência e a Tecnologia (FCT). Emiko Saldivar is Associate Researcher and Lecture at the University of California in Santa Barbara, previously she was a professor at the Universidad Iberoamericana in Mexico City. She is the author of Practicas Cotidianas del Estado: Una Etnografia del Indigenismo. Her work focus on race and ethnicity in Mexico and Latin America with special emphasis on state formation and Indigenous people. Gayatri Chakravorty Spivak is University Professor at Columbia University and a founding member of the Institute for Comparative Literature and Society. her academic work spans 19th and 20th century literature and politics. She is the author of many influential works such as In Other Worlds: Essays in Cultural Politics (1987), Outside in the Teaching Machine (1993), A Critique of Postcolonial Reason: Towards a History of the Vanishing Present (1999), Death of a Discipline (2003), Other Asias (2005), An Aesthetic Education in the Era of Globalizaiton (2012) and is currently working on Du Bois and the General Strike (forthcoming). Shirley Anne Tate is Associate Professor in Race and Culture, Director of the Centre for Ethnicity and Racism Studies at the University of Leeds, UK and Visiting Professor in the Centre for Reconciliation and Social Justice, University of the Free State, South Africa. She has published on raced intersections, the body, beauty, affect, post/de-colonial theory, critical mixed race, race performativity and racism. Françoise Vergès is currently Chair Global South(s) at the Collège d'études Mondiales, Paris, and Consulting Professor, Goldsmiths College, London. She is the author of numerous articles and books on the memories of colonial slavery, Frantz Fanon, Aimé Césaire, the processes of creolization and the postcolonial museum. She is also the author of film scripts and an independent curator. Professor Encarnación Gutiérrez Rodríguez is Chair in Sociology at Justus-Liebig University, Giessen. Dr Shirley Anne Tate is Associate Professor in Race and Culture at the University of Leeds.